Download the latest version (6.0H) of the control program for the AR-32A EPROM+ programming system. There are three download options: ISO image, SETUP program or ZIPPED FILE PACKAGE (PEPPAK). The ISO image file allows you to create a bootable CD which includes not only the latest software but the user manual and documentation. The SETUP program is the fastest way to upgrade and will install the software under Windows 2000, XP or Windows 7, 8.1 or 10. You also have the option of installing the LOCKSMITH reflash libraries and AIBBAG crash data clear template package. The PEPPAK is a file package which allows you to install the software under Windows 95, 98 or ME. You may also copy the files to perform a simple update. 1. Click the link below to download the file pepv60g.iso. 2. Use a CD burning/creation program such as ImageBurn to burn the image to a CD. 3. 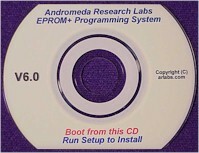 To boot from the CD insert the disk into your computer and reboot. 4. To install on your hard drive run setup.exe. 1. Click the link below to download setup.exe to your desktop or other location. 2. Double click the executable and follow the instructions. 3. The setup program will install the software under Windows 2000, XP,Win7, 8.1 and 10 plus place an ICON on your desktop. 4. You may also install the Locksmith reflash file library and Airbag crash data template package . The PEPPAK is a ZIPPED file package which you can use if you wish to install the software under Windows 95, 98 or ME. The ZIP file is called PEPPAK6. The PEPPAK contains just the files required to install the software on a machine with an operating system prior to Windows XP. It does not include the documentation for the locksmith or airbag packages. 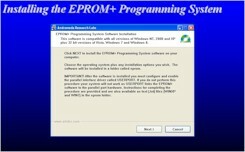 To use the PEPPAK download the package then create a folder called EPROM. Copy the PEPPAK zip file to the EPROM folder and unzip. Read the PEPPAK.TXT file for more information. If you are the owner of a non-upgraded Model 32 or a Model 28, the last software released may be downloaded from the link below. The software is provided in a .ZIP file which includes the executable (P41h.exe) plus a short README file with instructions. Warning! Do not use this software on a Model 32A programming unit as the software algorithms are not compatible. 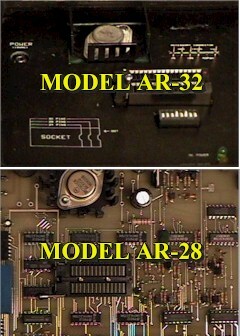 The Model 28 (bottom image) is easily recognized as it is a bare circuit board in a hinged case. 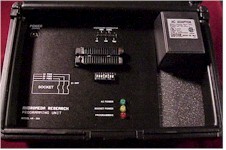 The Model 32 (top image) can be recognized as it has a silver voltage regulator mounted to a black heat sink which protrudes through the programming unit overlay.